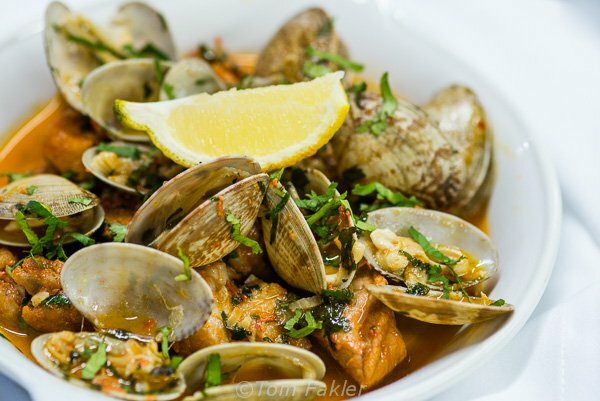 The food of Portugal’s largest province is fresh, local and hearty. 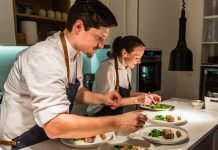 Alentejo is blessed with lots of pasture land and a long seacoast, which translates into substantial foods to fuel a hard-working country lifestyle. 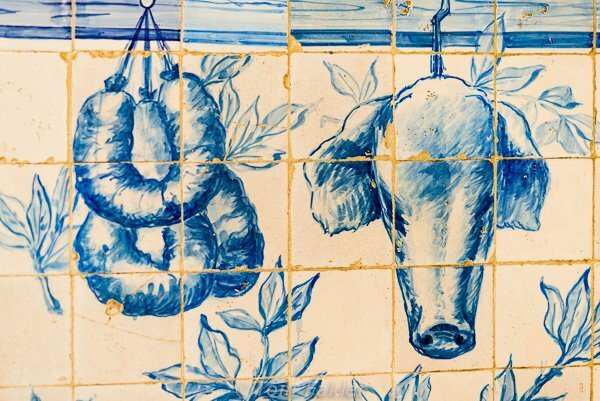 For a foodie, it can be a pleasant surprise to learn that Portuguese foods and wines speak the language of the sun hereabouts, even in February. Here are a few impressions, from my winter meander through the land of wheat and cork. 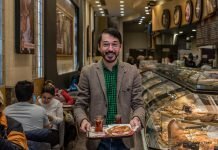 I always enjoy visiting local markets, at home or when traveling. At the Saturday market in Evora, local farmers come to town to soak up sun, chat up their neighbors, and do a brisk trade in cabbages, cabbage flowers, leafy local broccoli, leeks and root vegetables. 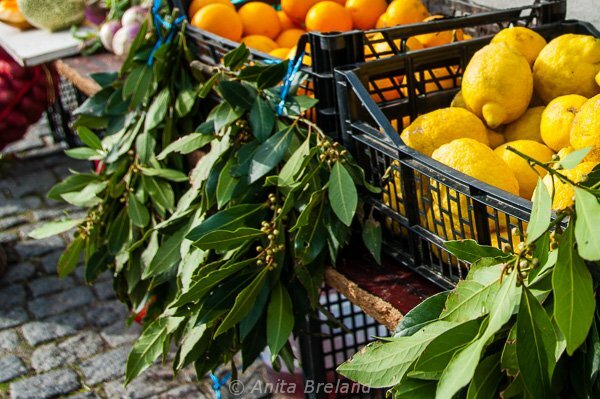 Many of the dishes in Alentejo are infused with citrus and the flavor of laurel, or bay leaf, readily available in local markets. 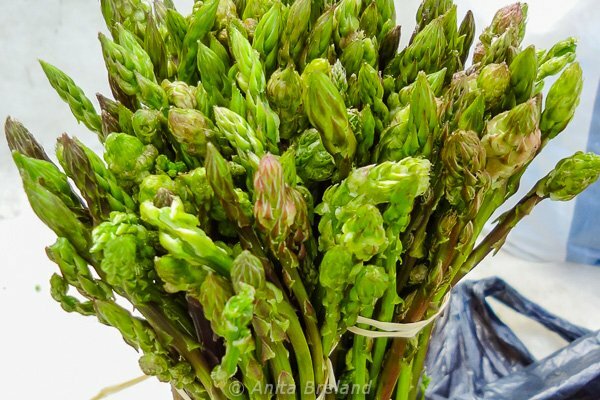 In February, vendors in the markets and their own roadside stalls sell bundles of wild asparagus. Also on offer, leeks and a variety of leafy greens. 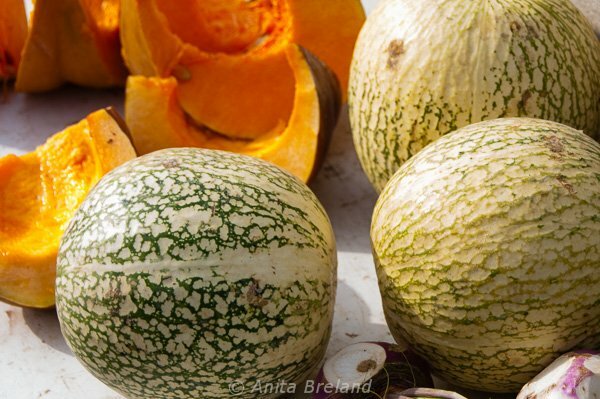 Pumpkins and gila, or Malabar gourd, appear in winter markets. Besides the pumpkins that make their way into soups and stews, both are used to make marmalade. Bread figures in every meal, and earns its place at the table. Hearty country loaves are sliced to accompany everything from honey to cheese to olive oil. Açorda is a robust soup of bread and broth, plus seafood or meat and egg. 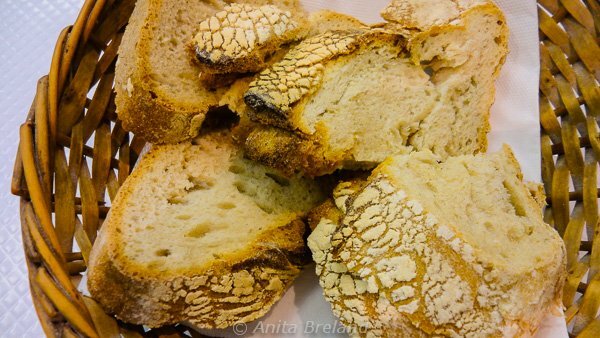 In most restaurants, the bread basket includes dinner rolls, but for my tastes, the local bread is the best. Bread is the first item on the table, and the basket on my table usually requires topping up before the main course arrives. 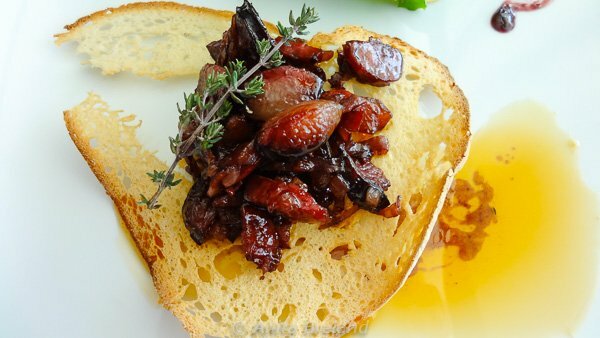 When I arrived in Alentejo, with its rich cuisine, I was happy to taste foods that fit the season, superbly. Pork is the meat of choice here, and the region’s black pork, from pigs fed mostly by foraging for acorns, is especially succulent. The Portuguese are snout-to-tail fond of their specialty porkers, which can be a little overwhelming to a newcomer just wanting to sample a bit of this and that. Much as I enjoyed a taste of black pork, I was delighted to find worthy alternatives. A specialty from Hotel Horta da Moura, near Monsaraz, black pork sausages in wild honey: sweet and savory with a touch of thyme. A little goes a long way! 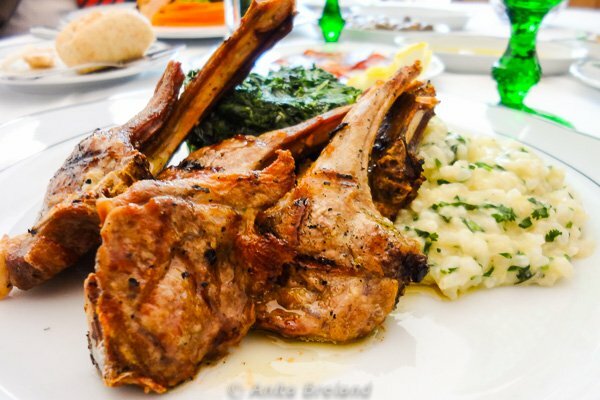 The delicate lamb chops I ate devoured at Pousada S. Francisco in Beja, spiked with herbs. Served with sautéd spinach and coriander risotto, they were just about the best I’ve ever put in my mouth. 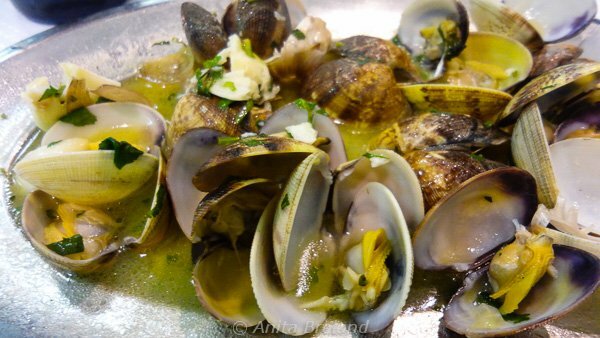 An Alentejano version of “surf and turf”, in this case, from the kitchen at Pousada de Estremoz: stewed local pork with clams from the coast, flavored with garlic, citrus and a lashing of coriander. Seafood of all sorts is on the menu in Alentejo. 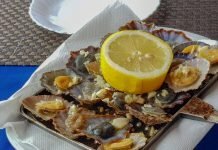 My hands-down favorite turned out to be clams prepared simply, with lots of garlic and coriander, at a popular-with-locals restaurant along the coast road above Vila Nova de Milfontes. Soups are hearty, and often ample enough to share. My husband and I quickly learned to order just one, and share, especially if we wanted to leave room for anything else at the meal. For us soup, salad and bread made for a rich and satisfying luncheon option. 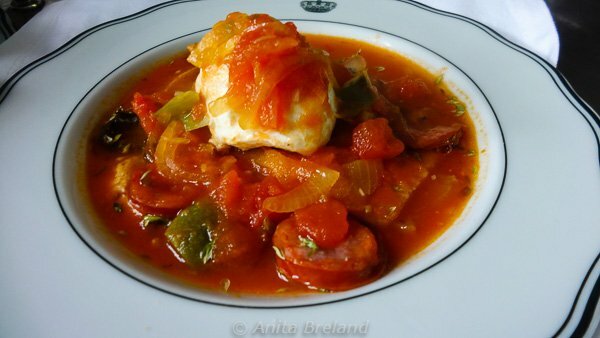 In Alentejo, tomato soup is much more than tomatoes: it sings with herbs, and can come with two kinds of pork sausage, sautéed onions and peppers, slices of bread and a poached egg. Whew. Portuguese desserts range from the simple to elaborate and egg-rich desserts from the region’s convents, and many options in between. 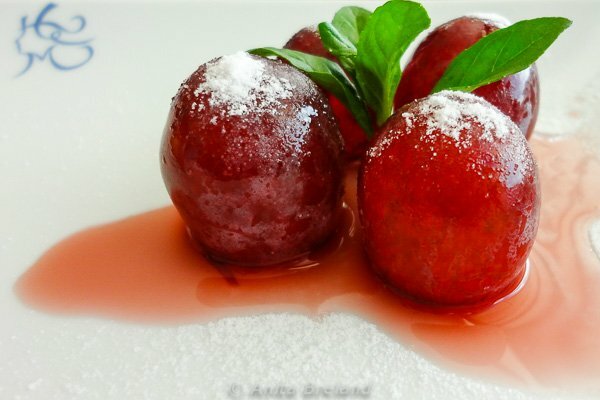 Alentejo’s unusual convent sweets are almost a meal unto themselves, and deserve their own post! 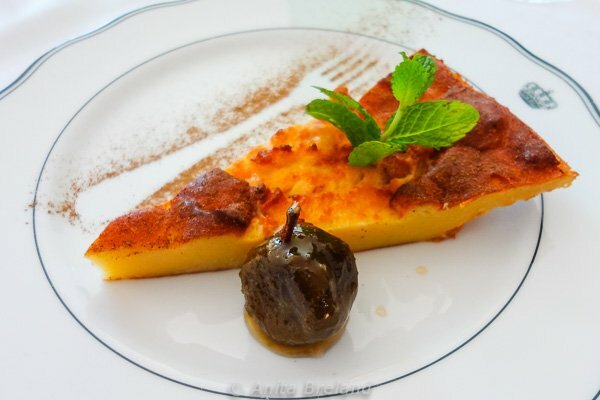 This custard tart with a candied plum alongside is a mid-range dessert choice in Alentejo: not too heavy, not overly sweet, decidedly eggy. A few of these (enormous) sugared grapes are satisfying , to end a meal featuring several courses of Alentejo’s famous black pork. So, now we’ve done starters and a meal…which leaves us breakfast and cheeses, wines and spirits. Stay tuned. 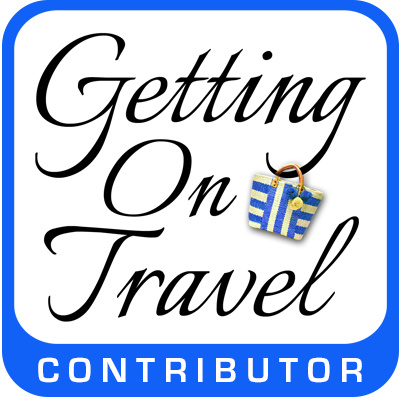 Many thanks to Turismo do Alentejo and TAP Portugal for making our stay in Alentejo possible. 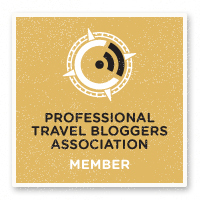 Happy to have met you Anita, and you have a lovely blog. Same here, Anu! I look forward to reading your blog, as well.